Get to grips with Realm Royale with our handy collection of tips and tricks. Our Realm Royale Guide is a great place to get an overview of all the game has to offer, so make sure you give it a read when you're done here! Before you drop into a match, make sure you head into the options menu and get your Video and Control settings all sorted out. Assign yourself keybinds and keyboard controls which'll make things far more comfortable in combat, as well as give you much speedier key inputs too. Realm Royale's also all about shooting your enemies and for this you'll want a mouse sensitivity that you're comfortable using. We'd recommend setting it at around 400 or 800DPI and tinkering with the in-game sensitivity settings before testing it out in a match. Doing this will make a world of difference to your game! Make sure you've got all bases covered with the weapons you've got equipped. We wouldn't recommend having a Sword and Shotgun equipped, as it would severely hamstring your long to mid-range offensive capabilities. No matter what situation you're in, you'd be forced to close the gap to deal any damage. It's far too predictable and very risky against an opponent who's ready for your charge. Instead we'd recommend having a combination of both a long to mid range weapon and a short range weapon in your arsenal. This way you'll be ready for any type of fight that comes your way. Shotguns and Swords are brilliant at tackling foes up close and personal, while a Rifle of some kind is a perfect way of denting health bars from a distance. It may seem incredibly obvious, but you'll be surprised how many times we've had to remind ourselves - get into the habit of using your abilities in a fight. Make sure that you're not just shooting enemies in an encounter, but focusing on utilising the power of your abilities as well. Much of this comes down to muscle memory so force yourself into pressing those ability keys until it becomes a natural part of your game. It's easy to panic when you've been jumped on by an opponent and completely freezing up is one reaction we've come across a fair deal. Scrambling backwards frantically switching between weapons and fumbling abilities is easier said than done when you've not had ample time to prepare for a fight. That's why it's important to try and keep a cool head in a tricky situation. If you're in a pinch, you're automatically on the backfoot. In this situation your first port of call should be backpedalling and positioning yourself in a better place. Use your abilities to blink, roll or thrust out of there before thinking about how best to utilise your weapons and offensive spells to inflict some damage and make them think twice about challenging you. 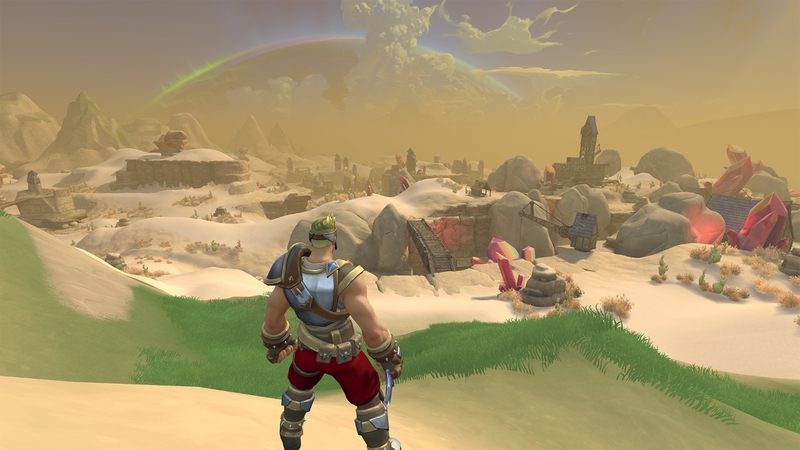 Getting off to a good start in Realm Royale isn't just down to where you land, but how you land too. When you land from a height, you'll do a ground pound style maneuver. You'll smash your fist into the ground Iron Man style and it'll actually leave you completely vulnerable for a second - not ideal. You can actually offset this little delay by using your movement ability the instant you enter this animation, which is worth doing if you know that an enemy's nearby. It goes without saying that whenever you encounter weapons and armour out in the world, you should always take into account their rarity level, compare them to your current equipment and swap them out for a stat boost. When you start a game you won't actually have any abilities to use (beyond your basic starter ability), so it's up to you to find them by cracking open chests. Your inventory slots only allow two weapons and two skills to be equipped at any one time, so you'll need to decide which skills you'd like to do battle with. In terms of selecting the right skills, it's very much a question of personal choice. Try them all out in a variety of scenarios and see which one you find the most effective. Considering you can only equip a maximum of two, it's worth taking into account how both skills synergise with each other. Question whether you want straight-up damage, or a touch of healing and utility too. You'll only be able to craft one piece of Legendary Armour at a particular Forge, so you'll need to visit a number of them if you're after a complete set. From what we've played of the game so far, we've found it absolutely crucial that you're wearing at least 3 or 4 pieces of Legendary gear as you approach the final moments of a match. Why? Competition is fierce and more often than not, we've found enemies in the final circle always seem to sport the very best stuff. With this in mind, try not to stay in one place at a time and keep moving between Forges as the circle constricts. While it's a riskier strategy than most, it's one that'll win you more games in the long run. Unlike other Battle Royale games, you’ll turn into a chicken when your health bar reaches zero. Survive long enough without being blasted into a puff of feathers and you’ll be given a second chance at life. When you’re in chicken form do your absolute utmost to flee from the scene. Use windows, ledges and doorways to your advantage and don’t forget to make the most of the third person camera to anticipate your opponent’s movements as well. Remember that when you're in Chicken Form, you'll only cluck and bawk when moving. If you think you've lost your enemy in the back alleys, then it might be worth tucking yourself away in a hidden spot, standing still and hoping that your silence will be enough for the revive timer to tick down.